Amanda Borden knew that she wanted to practice in the areas of elder law and estate planning well before she attended law school. Her desire to help people began at home, with a belief that family should care for one another however possible. She carried these values with her as she worked throughout her adolescence with her church's youth group performing community service for their local chapter of the Salvation Army as well as nursing homes within her home town of Painted Post, New York. Throughout law school, Amanda made it a priority to help those in need through the school's Elder Law Pro Bono Project. This Project gave her the opportunity to speak to elderly members of several communities and ensure they received the tools and resources needed to handle the complex areas of elder law and estate planning. 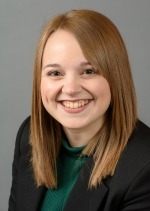 Prior to joining Ettinger Law Firm, Amanda received her Juris Doctor from Albany Law School. She worked in the law school's Clinic and Justice Center where she gained valuable experience representing her own clients. Working in the clinic allowed Amanda to develop the necessary skills to approach every client's individual needs with compassion and sensitivity. Her experience in elder law and estate planning continued while she was in law school when she worked as a law clerk for an attorney who practiced primarily in these areas of law. Amanda drafted estate planning documents and assisted clients in the Medicaid application process. Through both the clinic and her law clerk position, she saw firsthand what happens when people fail to plan ahead for their future and how it can affect their families. She is proud to be able to continue assisting families in planning for their futures as a member of the Ettinger Law Firm. Amanda currently resides in Glendale, NY.